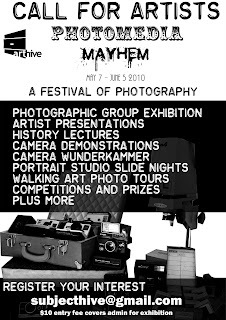 As a special treat as part of the opening of our PHOTOMEDIA MAYHEM festival, composer/sound artist Kraig Grady will perform in the gallery from 6pm on Friday May 7. Kraig will have CDs available so please do support him in his travels through Australia by purchasing a copy. Kraig Grady, an Anaphorian now living in Australia, composes almost exclusively for acoustic instruments of his own making or modification tuned to just intonation. Often his work is combined with his Shadow Theatre productions. Kraig will be performing on one of his main instruments, a vibraphone that has been retuned to a scale known as Meta-Slendro. This 12-tone scale developed by Erv Wilson and likewise found among the people of Anaphoria Island, comprises harmonics that occur in a recurrent sequence of similar properties to the Fibonacci series. Grady has selected out of the almost infinite variations of this series, one of those found upon the 'slopes' of a figure known as Meru Prastara. Due to the strong reinforcement of difference tones and beats, the music is able to venture also into explorations in room resonance and acoustical phenomenon using the nowdays often disregarded parameter of pitch. His work has been presented at Ballhaus Naunyn Berlin (Germany), the Chateau de la Napoule (France), the Norton Simon Museum of Art (Los Angeles) , the UCLA Armand Hammer Museum, the Pacific Asia Museum, the Los Angeles Philharmonic's American Music Weekend and New Music America 1985. He was chosen by Buzz Magazine as one of the "100 coolest people in Los Angeles". Check out this video of a Kraig Grady collaboration with Chris Abrahams. There is an exciting opportunity for an artist to work with school children and the community on a paid public art project. Are you someone that may be interested in a short contract to assist to facilitate some artworks this kind of art project? 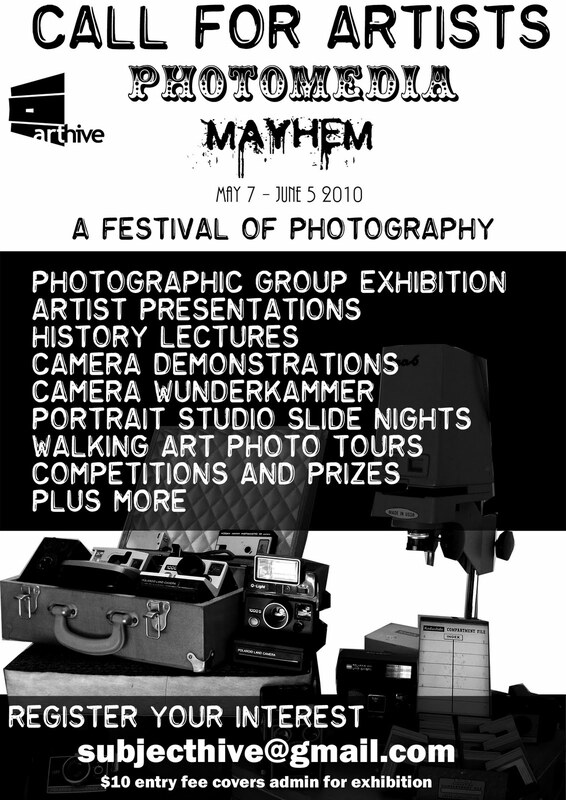 Photomedia Mayhem is a month long celebration of all things photography. We are looking for artists to submit works based on the triple concept of ‘PAST/PRESENT/FUTURE’. This could be interpreted literally, in terms of technique and medium, or a conceptual interpretation, based on photograph subject media. The theme is very open! We want the exhibition to be a survey all many kinds and styles of photography. You can print your photos on the back of beer cartons for all we care, get creative and show us what your photo media is made of! Submissions due Sunday 2nd of May by 5pm. Please print entry forms and attach to your submitted work. An entry fee of $10 per entry will be charged to cover costs of the exhibition. An entry form will need to be filled out with each separate work entered, including a $10 entry fee per entry. Entries can be a series or individual work, falling under one title. If you think you would like to contribute to this exhibition, please get in touch. Simo Soo has a new album out through Lesstalk Records! To celebrate, he is taking off on a whirlwind tour of the world, making a special return to the ARThive, where he last performed back in September for the opening of our TYRANNOSAURUS REX exhibit. In addition to Simo Soo, you can catch the oddball genius of our own CasioGloria, the noise rock of Liz Hurley, and the synth explorations of Stitched Vision. Here is a short video document of Melbourne's Infinite Decimals live in the gallery on April 3rd 2010. To what was a very small but appreciative audience the band performed two extended pieces of improvised experimental music accompanied by marvelous visual manipulations by Paul Rodgers. Coming up on Sunday April 18 is Cuddle Party #2, an all day music festival in the gallery! The first event back in January was such a swell way to spend a sunday we figured we might have another! Before you freak out, this isn't some pervy gropefest, just a posi day of sharing music and rad vibes. This cuddly day will feature a whole bunch of great live music including a rare trio performance from Polyfox And The Union Of The Most Ghosts, debut sets from The Origami Girls and Fairy Mountain, plus CasioGloria, Hira Hira, Little A, Michael Crafter, Happy Phlegm, The Luke Hoskins Inexperience, Apartment, Blind Jake, Mark Lagana, Miles Thomas And The RVs, and possibly more. Bands will kick off around 12pm and entry is by donation, with funds raised going towards some new paint, tools, and essential supplies for the gallery. See you there!